Randy Gitsch is a key part of the revival of Cinerama and a regularly welcomed guest at the Widescreen Weekend. For this, and his continued work in film preservation and filmmaking, we are delighted to welcome Randy Gitsch to the Academy of the Widescreen Weekend. Johan is still promoting 70mm and celebrating movies in 70mm and Cinerama and 60 years on from the birth of his great passion and in recognition of his tireless work we are delighted to welcome him to the Widescreen Academy. Tom March has made an outstanding contribution to bringing life back to the finest of widescreen formats that we all love. 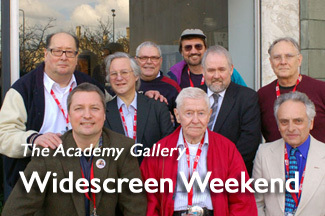 There were many people who made the 60th Anniversary of Cinerama celebrations at the Widescreen Weekend in Bradford a success, but the contribution made by one man was particularly exceptional. Kevin Brownlow is a man of extraordinary knowledge of the history of cinema. Not only a researcher, but great explainer through seminal documentaries and books on the golden days of the industry. But to the widescreen world he holds a special place for his championing of the work and vision of Abel Gance. 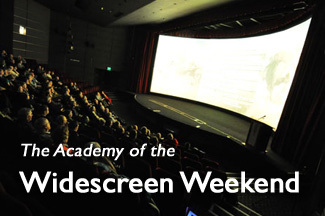 Recipient of The Academy of the Widescreen Weekend's Roll of Honor. A projectionist, phenomenal collector, showman and Cinerama enthusiast extraordinaire. A strong believer in promoting the Cinerama experience, that has remained a regular, steadfast part of this museum’s programme since it premiered here in 1993. This man works in Hollywood, where he sometimes presides over film presentations at the local “three-strip” cinema. His encyclopaedic knowledge of cinemas in his country’s capital is amazing. I have visited him in France and met his family including the cats – one of which is called “My Fair Lady”. Wherever he goes...and he is a world traveller...he is unable to resist any opportunity of seeking out, discussing, and promoting what for him must surely be "The Big Seven Zero". Our nominee for inclusion in the Academy is a true "child of the cinema". A lifetime devotee of everything cinematic. He could accurately be described as a "Human Movie Database". A true Cinerama enthusiast, typed, edited, a Cinerama newsletter that he posted to similarly minded enthusiasts all over the world, at his own expense. Willem's role in life was defined when his dad took him to see Cinerama. When NMPFT was looking for a new attraction. For him the logical choice was Cinerama. 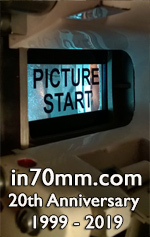 To promote Cinerama, 70mm and 'Scope formats in all their splendour. It is the duty of the Academicians to ensure that the membership grows year on year. It is their duty to create whatever rules are necessary to the pursuance of these aims. 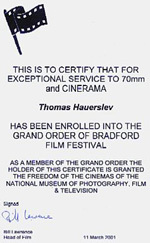 Membership in the Academy is by invitation of the Board of Governors and is limited to those who have achieved distinction in promotion of wide screen activities of a caliber which reflect the high standards of the Academy or making of an outstanding contribution to the wide screen film community. The Academy was organized in November 2001. The NMPFT felt it was in place to pay tribute to John with a special award - a scroll - , thanking him for his contribution to revitalize Cinerama. Thanks to John's enthusiasm, Cinerama has again been made available to the public.